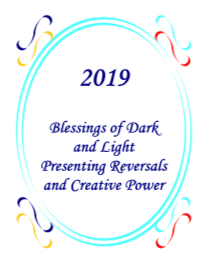 Many of you will recognize a strong essence of 2019 within the vibration of this month. It is the power of the number 12 – Law of Reversal and Law of Reflection provided through the agent of the Universe we honor as Neptunia. This month is filled with the Magick of the Universe and the Holy One’s intentions to give us the guiding rays of light and waves of energy through our psyche to help us reverse our trends of separation. Ash Moon vibrations help and guide the way. Always Magick flows as this cycle of Ash occurs. Her vibrations of the Universal Law of Life, Death, and Rebirth along with the Law of Reversal and the Law of Reflection entered my life as the initial energy of the Sun was preparing to enter Pisces (Ash). In fact, at 6:02 pm. on the 17th of February, the Sun was at the most prominent point of 29 Degrees of Aquarius ready to enter Pisces. At that time I was in an airplane flying to Sacramento. My brother was passing from earth and I had the beauty of “seeing” him as he began his soul journey in a new way. I was experiencing his death, rebirth in a new realm, and reflecting on his life and death journey. The gentle flow of the initial states of Ash/Pisces guided our family through a unit of One, with deliberate compassion, love and intention to create a sacred remembrance through church services and a gathering afterward. Our family truly used Ash’s Key Words: The Key to Magick is in your Heart! We shared a week of heart loving assistance of each other and the soul of my brother. My brother was born in this life under the Light of Leo and exited under the Light of Aquarius (his internal self; his polarity). Our souls are remarkable in their plan of Life, Death, and Rebirth. 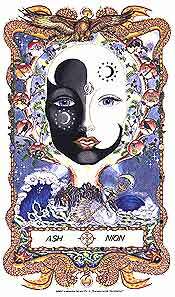 As we enter the New Moon on March 6th, we follow the flow of the three stages of consciousness: Cognitive, Subconscious/Unconscious, and Supernal Consciousness. I marvel at the lunar cycles that initiated our year. Birch, Rowan, and Ash. They present states of renewal and creating our path with sacred intentions. They are foundations of the New Year. We have the ability to set our dreams through the pathways of All Dimensions, willingness to set the patterns with a higher intention rather than simply acting as a human being separated from the Holy One; and finally, with Ash, setting the intentions within the Oneness field of the supernal consciousness and an absolute sacred flow and attitude cognitively. Once these three lunar states are anchored in awareness, we can move into the true Action state for the year with Alder next month. Awen! Blessings! Enjoy the blessings that unfold for you throughout this lunar month. Contemplate, blend, and sacrifice patterns of limitation while you open to the flow of the three states of consciousness offered to you through the stages of the Holy One’s Grace. Please read the Cosmic Notes before you start setting your vibrations for the month (www.katherinebell.org). Also on the website is the Ritual for Spring Equinox that occurs on Full Moon, March 20th. From the depth of the sacred ocean of consciousness wisdom arises to our cognitive state. It provides us with a knowing: We do remember that we are Holy. We do remember that we are creators. We do remember how to transform and old pathway, let it pass away, and let a new path be set by our awareness that change is the pattern of the universe, the pattern of seasons, and the pattern of ourselves. We are change! recognize it in many ways. We know we slough off 50 million skin cells daily. Internal cells give way to transformation daily as well. They have completed their life and death process, and slough off to renew the cellular essence of our physical reality. This happens automatically, without a greater attention consciously. So with our bodies, so with our states of consciousness. During the lunar cycle, we are to work with the Ash vibration consciously. We are to remember that we are the power to release what has been birthed and grown to its fullest qualities (even if our human mind doesn’t think so), let go to the ending process, and allow a new birth to occur. Thus, it is a month to review and reflect on the powers and challenges of our life that may be repeating only to teach us we must take conscious command that honors what has lived, let go, slough off, hold an honorable burial, and be ready to replace the field of creativity with a new birth. How do we do this? We c heck and review all avenues of our life. We question: what is still growing and calls for our sacred attention to expand it? What is still within our world that is revealing signs of degradation and requires a reflection that reveals the way to let it go and righteously celebrate its life and prepare the sanctuary of its death as we honor all memories of the journey we took. This process is often difficult for our human reality as we desire to keep our hands, hearts, and mind holding tight in the hopes that there is more to do with a process that was truly temporary. The next step is a rebirth. Is it a new process of the old and dying? Is it a new pathway that provides strength and wisdom because we did let go, honored and released the old experiences? Or are we presently growing in a new way and our sacred heart needs to lead the way? The Ash energy aids us in moving through this process. It calls us to the sacred heart. Its vibrations set the path of sanctifying the old and sanctifying the new. Ash provides us with the power of cellular memory (all experiences coded in our whole being). As the power of cellular memory is within us, we also have the power to slough off the old and dying memories and release them to the Sea of the Holy One to transform into new cycles. Ash carries the sacredness of spiritual ceremonies/rituals. I invite you to a ceremony of allowing the old and new to be honored. Activity: Take time to review all the paths of living, creating and expressing you are experiencing right now. Write notes about each. Are they processes that require your attention to flourish or your attention to release, let go, and allow its cycle of ending (death) to occur? Write wisdom notes with a sacred intention to reveal what you have learned and are learning. The paths that are truly ready to be free from your actions via your conscious, unconscious and higher conscious require your grace (unearned blessings). Write a short story of why you entered the path of each event in your life now, what you learned or are learning, and why you might be holding onto an experience that truly provides no further qualities in your life now. Ask yourself how you can give it honor, prepare a sacred release and celebration of its ending, and give it a proper burial. Be loving and compassionate with yourself, the process you are willing to end, and offer the Right of Passage into the burial place of the great ocean. Prepare a sacred ceremony. When you are ready, release it to the universe. Some individuals do a release through fire. With Ash, it may be a release through water. If you choose water, then write out your full intent to let go, releasing the need to hold on to what is no longer in service to you. Do this with ink and place the paper you have written on in a bowl of hot water watching the ink transform from written words, to murky words, to no words. Prayerfully honor and let go as the ink dissolves. Allow the Holy One to receive your gratitude and love for what has been and what now is given back to the great Ocean of Consciousness. To let go of actions, activities and projects that no longer serve you allows a void to occur. This void is a vibration of sacred silence. It calls you to connect with the void expressing a devotional attitude to be open to receive blessings from the Holy One and creative encouragement to enhance new steps you are taking or to create a new pathway that will develop through the energy of a life-supporting field of intuition, mental clarity, and emotional delight. Thus spend time in sacred silence before you take the next action. Activity: Take up your paper and pen (or canvas and colorful pens) and further design your pathway that needs your creative attention. If you are feeling a birth of something new or further creativity of an evolving process, write or design a picture of it. Come into the pleasure of creativity. Use the valuable energy of creative imagination and let it flow onto your paper or canvas. Become the living mother of this new birth. Nurture these qualities with love, compassion, and encouragement. Feel the holiness of what is stirring within you and absolutely enjoy it! The conscious state of Ash brings forth the quality to remember our wholeness as a created soul/human aspect of the Holy One. Remembering we have the All Knowledge of the Holy One reminds us that we truly have the capacity to create within the flow in our evolution of changes and create from a greater wisdom base than, perhaps, we have ever used. Ash has presented the intentional foundation to review the old and the new as well as to slough off what is dying or even dead that we might try to keep a strong hold and grasping onto what needs to be set free; thus not letting it go. Neptunia will be a great active assistant in letting go. For the moment I am going to reverse her Law: When we review our experiences we use the intention to reflect upon what has been and the possibilities of what will be. In the view of what has been, we use the Law of Reversal to release and let go. As we notice new growth in possibilities we are working with prospects yet to be, we reverse trends that might sabotage the blessings of creating a new outcome. We can notice when we enter old beliefs and act as though we are limited. We can use the Law of Reflection to cognitively recognize that we are filled with creative blessings, intuitive guidance, and always the Grace of the Holy One. The choice is always ours. 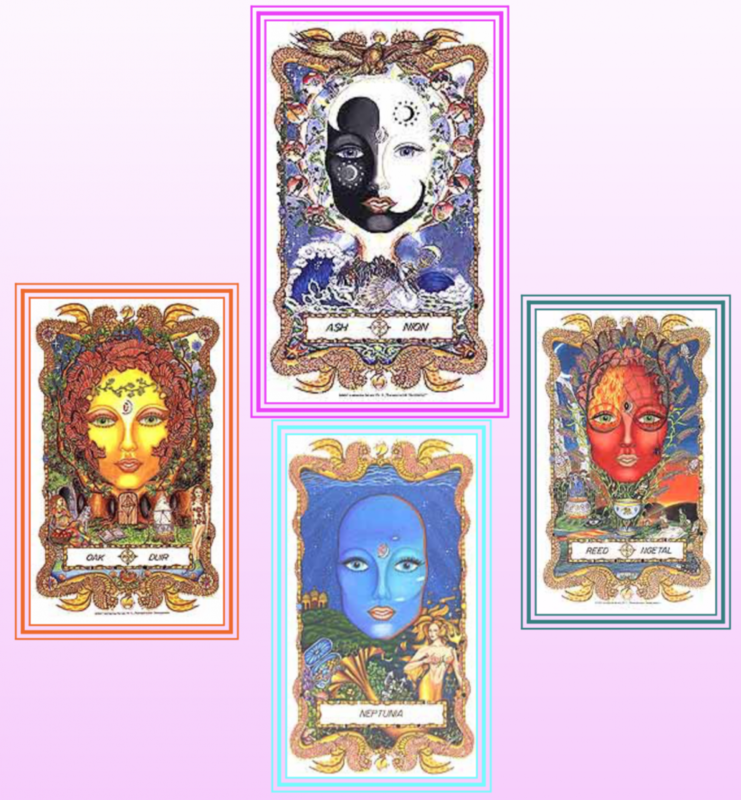 Using the cognitive power of Urania, we can feel our inner power, release our inner creative qualities, and reflect the greater vision of what is to be manifested. We can work with a higher order of our essence and become quite artistic with the way we intentionally want to create outcomes of success and delight. We become a manifestor through conscious realization of our power as the image, likeness, and all qualities of the Holy One. Like the three temples seen in her picture, we are a storehouse of Akashic Records…records of all life and all wisdom. In the cognitive state, we can clearly dive into the realm of all knowledge and with the fish hook of last month (Rowan), we can capture the creative processes that will serve us well. Cognitively we are called to use the creative powers of Neptunia: review, reflect and make changes. To review, reflect and use the inner power of our Holy Self we bring forth a new birth of our essence, our desires, and our abilities to recognize the Grace in our ever evolving living as a human being. Use this active power of Urania to help you with the Activities noted in page 4. Enjoy the blessings and the journeys of consciously using such sacred energy that resides in your cellular memory. Subconscious power of Oak provides us the review and memory of this lifetime. In the sacred review of memories called upon by the foundation of Ash and action of Neptunia, we are certainly called to look at the positive and challenging realities of the foundation of this life. Through Oak we begin with our parents, siblings, all family members, neighbors, friends, teachers, peers, lovers/mates, bosses, employers, children, and so forth. Every one and everything has been used to build the structure of our mind and emotions and the fodder of our subconscious memory bank. Some of those emotions are bitter and filled with hurt, hate, and hostility. Some are filled with love, nurturing, joy, playfulness, and delightful experiences. All in the subconscious level are veiled by time and additional experiences and may be more about perception than reality. That message becomes quite important to recall. If perception has tainted memory, we may absolutely get stuck in the field of untruth that is the fodder for distortions, emotional disabilities, and mental attitudes that keep us believing in the lessor power of ourselves. Thus, it is quite important to examine the subconscious with a willingness to discover truth rather than the injuries of dysfunctional experiences or the veil of positive experiences. We must bring them along the path of: Already lived while allowing them to enter the doorway of death, and experience a rebirth of our selves. Always, what appears to be bad and what appears to be good are useful. They are the teachers of our reality and we are most definitely called to learn the lessons of each quality. There is much in this foundational energy of the unconscious we can use. Every image in the picture is a gift of energy of the universe. Around the forehead of the Oak Face is the All Heal medicine of Mistletoe. Thus, no matter what wounds we carry in our memory, we have the power to heal them. We have the power to enter the space of renewal (cave). We have the ability to nurture our self (cauldron of soup), birth a new state of our being (pregnant woman), revitalize our energy (fire), prepare to enter new realities (door on oak tree), understand our life patterns (the book of life revealing our mystical journey and our common realities of living), and journey between the worlds of matter and spirit with our psychopomp (dog). All in all, we can tap into all wisdom (the apple) and know all life is within us (crab). By using all of these qualities noted in the symbols, we enter the realm of our unconscious and realize the beauty of our soul journey. Our soul is not judging, it is encouraging experiences of the light and dark, knowing they prepare the way for our evolution and awakening to our True Self. The soul presents the wisdom that we are always nurtured by the great Pro-nurturer – The Divine Mother. We are fed what we need to grow. We are provided with the tools of exploring, learning and developing. We are always provided with the tools for living in the containment of our higher self. Neptunia’s active state in our Subconscious/Unconscious within the foundation of Oak. Ah, so easy to see the blessings of Neptunia’s field of energy in the foundational realm of the Subconscious/Unconscious via Oak. Again, Neptunia will help us reflect and reverse false perceptions. 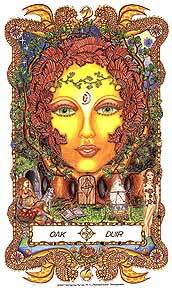 As we reverse the trends of dysfunctions and reveal to ourselves our inner power (do remember that Oak is considered a very powerful Tree and mystical essence of the universe via the Celtic philosophy). With this process we will allow the Light of our True Self to be actualized and reflected in all that we do. Neptunia will move the waves of our subconscious/unconscious memories. This field of energy stirs the deep ocean of wisdom and flushes out the debilitating realities. She will reveal what is within our karmic path that we have chosen to heal and balance and express. She will reveal the true essence of our powerful self and guide us to express in harmony with a knowing that the only healer of repeating karmic patterns is Unity Through Love. Neptunia will activate the All Heal vibrations and aid your subconscious and soul conscious (unconscious) to recognize the Holy One within you. You will find yourself guided to the pathway of compassion and nurturing yourself and all others. In so doing, you will open the treasure box of higher energy influences that guide you to your true power as Spirit activating blessings in Human Form. The power of reversing and reflecting in these two levels of your being are the blessings of letting go and revealing your most sacred nature. In so doing you will reveal the creative qualities that are unique through your expressions within this lifetime. The higher state of consciousness is revealed within us as passionate, creative, prolific, capable of transforming all areas of our being, and constantly regenerating in new and redefined ways. This truly means that what was no longer is. What is, is so new we often don’t recognize or know how it occurred. Ah, the Magick of the Universe. It holds so much love for us in Its heart that it is willing to expunge all that we do, remember and create from so we may enter the realm of the great mystery of our Higher Self – the essence of our Creative Being—The Holy One. The Reed vibration sets the foundation for this deep clearing of our nature of being. Reed’s vibration encourages the release and let-go energy of transformation. 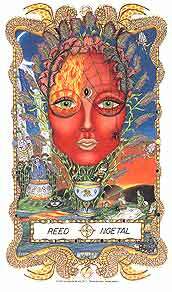 As a foundation of our Supernal Consciousness, it presents the peat fertilizer for our very essence to create new realities and to be used as the fire in the alchemical waters of true expression of our creative natures. It is hot and sensual, setting the foundation for the creative and passionate union with The Holy One. The heightened power of Neptunia is put into action to form the union of our three conscious levels to come into the Oneness Consciousness. The passion and power of Reed has set the foundation. The blessings of our Soul’s evolution is brought to bear. Neptunia provides us the birthing substance of the Ocean of Consciousness. She provides the embryonic nurturing fluid for our soul to grow into the master consciousness we carry within our humanness. Here the treasure box is fully open. The Akashic records are not left in the corridors of illusion, or step-by-step learning how to be Holy. It is here our holiness is known. It is here the All Knowledge is revealed. What is it we need to do to witness this in our human endeavors? Is it Faith? Is it Belief? How is it we experience and express it when it is contained in the higher dimension of our Supernal Conscious? Our “how” resides in the action of living with the open heart and open mind to love all. This guides us to understanding “The Key to Magick is in your heart.” We are to remember that our life on earth is a journey of experiences in a realm of multiple realities so we may know the multiplicity of Oneness that is expressed in every person and everything we recognize in the field of matter as well as the field of Spirit. Yes, Faith and Belief play a role in our personal expression. For Faith is knowing and Belief is the wisdom that the Holy One is everything, everyone, and every expression our individual nature can fathom (and beyond). 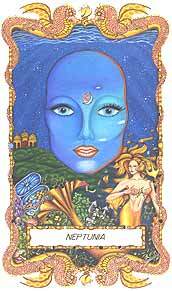 Neptunia provides us the open door to All Wisdom that resides in your Supernal Consciousness. Let this field of energy be active within you, not stored away for the future. In reality, Neptunia is all time and no time. She is the active force of the Holy One that is Allness and each one of us has the ability to know this mystery, understand it, and live it. Using the blessings of this lunar cycle prepares you to take on the very active field of developing your year of activities with the phenomenal foundation of sacredness. When we enter the realm of Alder, you will be ready to take action without hesitation. You will be ready to develop your world from the realm of wisdom. Please note these are not exact dates, but very close.